The sixth book in Laura Ingalls Wilder’s treasured Little House series, and the recipient of a Newbery Honor. This edition features the classic black-and-white artwork from Garth Williams. The fledgling town of De Smet in the Dakota Territory is hit hard by the brutal winter of 1880-1881. Laura, Pa, Ma, Mary, Carrie, and little Grace face the winter as best they can, but soon, blizzards have covered the town in snow that piles up to the rooftops, cutting the town off from supplies and trade. Food stores begin to run dangerously low. To save the town from starvation, young Almanzo Wilder and a friend brave the conditions, set off across the prairie in search of wheat, and return victorious. The town is saved, and the townspeople share in an unusual, but joyful, Christmas celebration. The nine books in the timeless Little House series tell the story of Laura’s real childhood as an American pioneer, and are cherished by readers of all generations. They offer a unique glimpse into life on the American frontier, and tell the heartwarming, unforgettable story of a loving family. 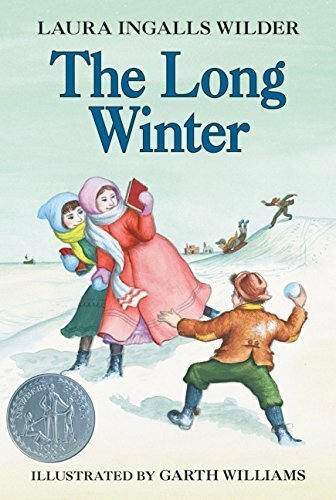 The Long Winter by Laura Ingalls Wilder is my favorite book in The Little House on the Prairie Series. I enjoy reading this book every few years during the winter. It is one of those books that always makes me appreciate what I have, because it really could be so much worse.